Gold prices continue to hover between $1,300 and $1,330 an ounce, and while some analysts are calling for further upside for the yellow metal, one firm thinks the long play is all tapped out. 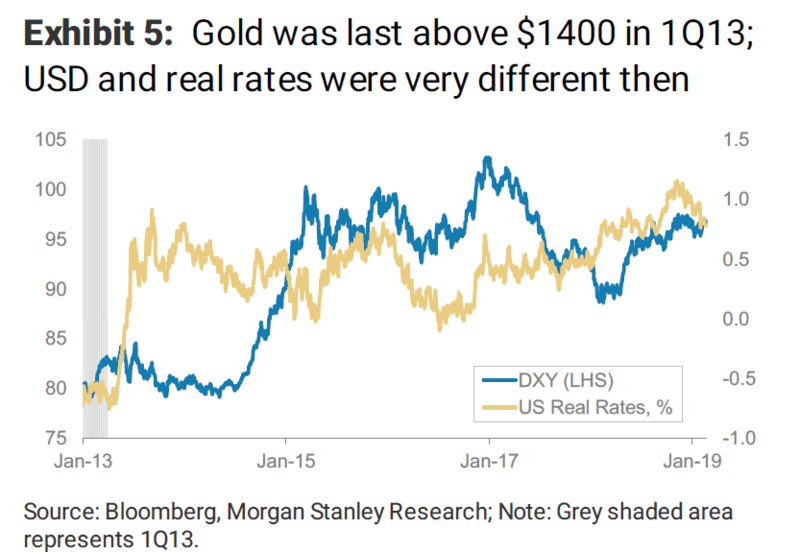 There’s no denying that the Federal Reserve has been indirectly driving gold prices with its dovish commentary, but according to Morgan Stanley, the problem is that gold has repeatedly failed to break the $1,350 per ounce level. As a result, the firm is closing out its “long gold” position. 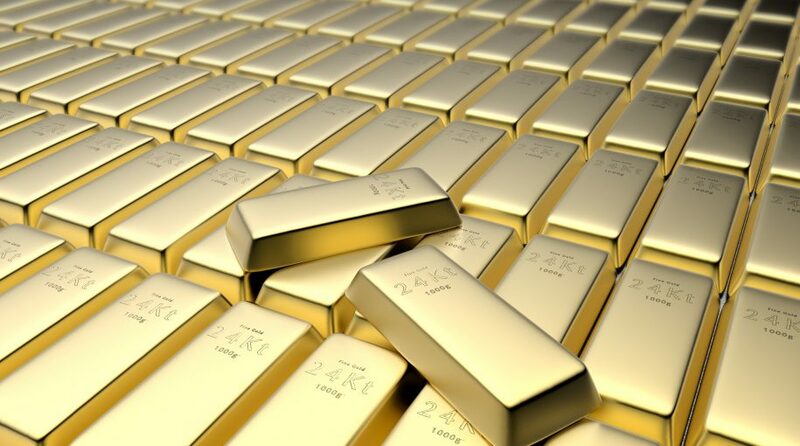 Strategist Andrew Sheets and team said in a note this week that they opened up their long position on the yellow metal in the third quarter based on sentiment and Fed expectations. Now months later, gold prices, sentiment and Fed expectations have all shifted significantly. They still expect the U.S. dollar to weaken, which should push gold prices higher, and they still look for lower real rates. However, they believe the market is already positioned for those moves. They note that gold prices have rallied since the third quarter and continued to move toward $1,350 an ounce, but they haven’t been able to break through that level. In fact, gold has struggled to reach $1,350 over the last five years. 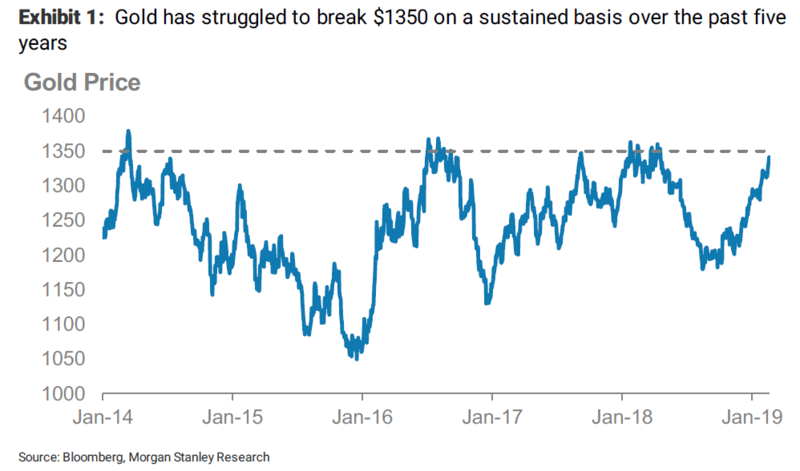 Morgan Stanley has set a price target of $1,350 an ounce at the end of this year, so at around $1,330, Sheets doesn’t feel there is enough upside to remain long on the yellow metal. Further, he feels sentiment has risen so sharply that the market has taken up a “goldilocks” view. He noted that sentiment on gold tumbled along with prices in the first here quarters of last year. The markets began to see the metal as less attractive compared to other assets because it has no yield. Fed shift already priced in? 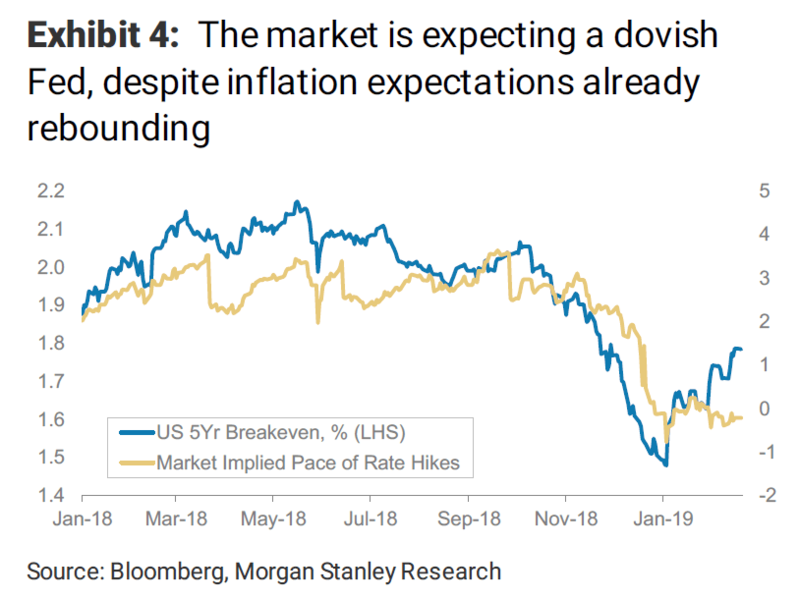 Additionally, the Morgan Stanley team pointed out that gold prices were boosted by dovish Fed commentary, but they believe the markets are now priced for interest rate cuts through the end of 2020. As a result, they doubt this catalyst will help raise gold any further. Sheets emphasized that the dovish shift in the Fed’s views has already happened, so gold has already priced in those easier expectations. Thus, moving Fed expectations even lower from where they are now would be difficult, especially since expectations for inflation have already bounced. For all these reasons, they no longer see gold as a “top trade.” Instead, they advise positioning more “directly for the above conditions, which usually drive gold higher. They also pointed out that the last time gold was trading above $1,400 an ounce was in the third quarter of 2013, and both the dollar and real rates were “very different” at that time. In addition to positioning “directly” for the dollar and interest rates, Morgan Stanley also likes the look of copper right now. The firm sees “bullish supply/ demand dynamics” there, so it expects the gold/ copper ratio to fall through the end of 2019. What if “Goldilocks” sticks around? 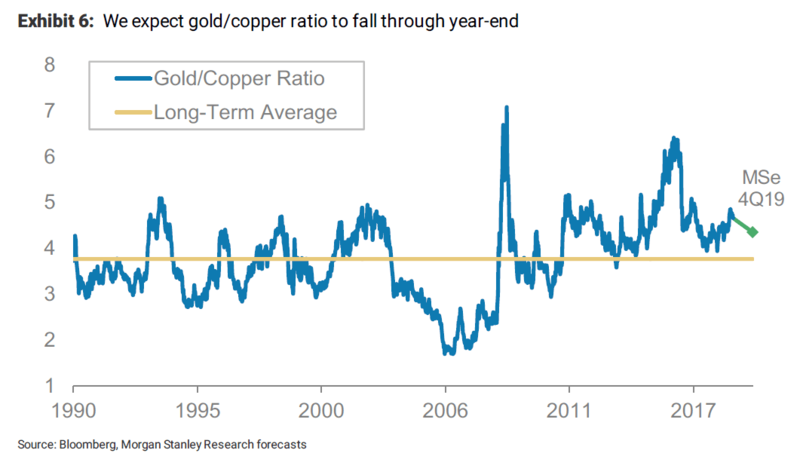 Morgan Stanley’s view on gold is quite different from those of other analysts. For example, BNP Paribas analysts remain bullish on the yellow metal. They expect the U.S. dollar to weaken further because they see it as “structurally overvalued,” which is why they think the dollar and gold have both remained higher, which is a rare occurrence. They also cited investor interest and demand as another reason for the metal to move higher. However, one thing we should note is that on Thursday, gold recorded its largest one-day loss since August. The metal turned lower after this week’s Fed minutes showed that some officials have reversed their dovish view, saying that if the economy continues as they now expect, more rate hikes could be in the cards. However, gold prices were back on the rise on Friday, putting the metal on track for its second weekly gain after weaker economic data. 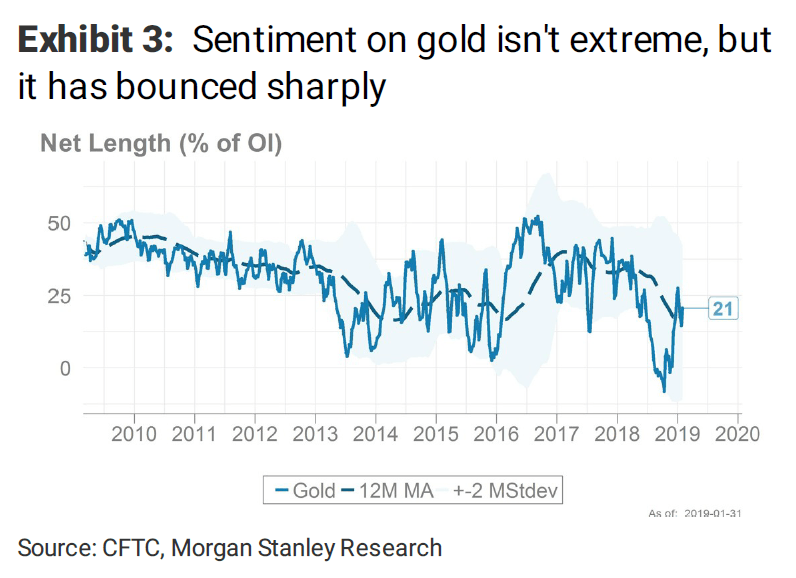 The Morgan Stanley team did admit that they could be wrong about gold. They admit that the yellow metal does have positive momentum, so it’s possible the “goldilocks” narrative could “remain dominant” this year.” If gold prices do finally break above $1,350 and stay there, then the firm may review its stance.